On September 29, 1891, the Club due Chien de Berger Belge (Belgian Shepherd Dog Club) was organized to determine the characteristics of the native shepherd dogs in Belgium. 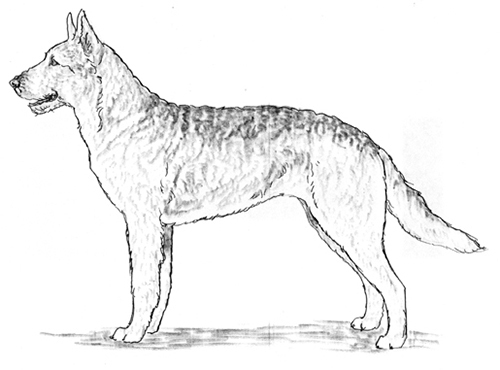 They defined a consistent type of native dog, anatomically identical but differing in hair texture, hair length and colors. During the first decade of the twentieth century, owners and breeders in Belgium urged acceptance of additional Varieties based on color and the adoption of place names to designate those Varieties. The black, long-hairs were given the name Groenendael. The fawn, rough-hairs were given the name Laekenois. The short-haired fawn with black mask and charcoaling was given the name Malinois. The name Tervueren was given to the long-haired fawn with black mask and charcoaling. Tervueren later became the designation for the long-hair other than black. His abilities as an intelligent and versatile working dog soon gained him popularity in other countries as well. The first Belgian Shepherd Dogs were imported into the United States in the early 1900's. Although earlier identified as three separate breeds, when UKC registered the Belgian Shepherd Dog in 1991, they were once again united as a single breed with four distinct varieties. Disqualifications: Unilateral or bilateral or cryptorchid. The Belgian Shepherd Dog was developed in Belgium as a herding dog to work sheep. He is enthusiastic and remarkably quick. He shows a natural tendency to be in motion. The Belgian was developed for endurance. He must be able to move and tend the flock all day and to guard it from all invaders. In addition to his inborn ability as guardian of the flocks, he is an exceptional watchdog and a tenacious and brave defender of his master and family. He is vigilant, and highly responsive to his owner's direction. He is alert, intelligent and inquisitive. While he is firmly loyal to those he knows and loves, he typically exhibits reserve with strangers. Medium width in proportion to the length of the head. The forehead is more flat than round. The occiput is not accentuated. Seen in profile, the upper line of the skull is parallel to an imaginary line drawn from the muzzle. Of approximately equal length to the length of the skull, narrowing gradually toward the nose. The upper line of the muzzle is straight; and seen in profile it is parallel to an imaginary line drawn from the skull. The mouth is well split. When the mouth is open, the corners are drawn well back and are in line with the eyes. The muzzle is well-chiseled under the eyes. Thin in texture, well-tightened, strongly pigmented, not allowing the red of the mucous membranes to show when closed. Clean and flat, although very muscular. Medium size, neither prominent nor deep set. Almond in shape, brown in color, preferably dark. Their look is direct, lively, intelligent and questioning. The eyelids are edged in black. High set, triangular, carried well-pricked. The ears are small to medium and in proportion to the length of the head and the size of the dog. The concavity of the ear (concha) is well-curved at the base. The base of the ear does not come below an imaginary line drawn from the corner of the eye. Disqualifications: Drooping or hanging ears. Jaws are well-developed and furnished with forty-two strong, white teeth that meet in scissors bite. A level meeting of the incisors is acceptable. It is the so-called pincer bite which was preferred by the herdsmen. The shoulder blades are long and sloping, securely and flatly attached, forming with the upper arm (humerus) an angle sufficient to insure the free movement of the elbows. The upper arms lie close to the body. They move in a direction parallel to the longitudinal (lengthwise) axis of the body. The dog single tracks as speed increases. (Metacarpal bones) Short, strong and slightly sloping. Round. The toes are curved and quite compact. The pads are dense and elastic. The nails are dark and strong. Not too broad, but in compensation, deep and inclined. The thoracic cage is encircled by ribs which are arched in the upper part, but flat on the sides. The back and lumbar/loin region are straight, broad and powerfully muscled and short. Moderately developed, neither hanging (paunchy) nor tucked up. It prolongs, in a harmonious curve, the line under the chest. Long, broad, well muscled and moderately angulated, without exaggeration. The hocks should be short, broad and muscled. Seen from the rear, they will be perfectly parallel (to each other). (Metatarsal Bones) Solid and short. Removal of rear dewclaws is preferred but not mandatory. Slightly oval, with the toes curved and very compact. Dense and elastic pads. The nails are black and strong. Disqualifications: Absence of or docked tail. The desirable size for males is 23 inch - 26.5 inch. The desirable size for females is 21 inch - 24.5 inch. Eliminating Faults: Males under 23 inch or over 26.5 inch. Females under 21 inch or over 24.5 inch. The gait is ground covering, effortless and seemingly tireless. The Belgian Shepherd Dog is usually in motion and is capable of working livestock all day. Because he was developed as a herding dog, and because of his exuberant temperament, he tends to move in circles around his owner rather than in a straight line. The hair should be rich and dense, giving good protection against wet and cold. The undercoat is very dense, corresponding with climatic conditions. Since the length, direction and appearance of the hair is different in the dogs of the Belgian Shepherd Dog breed, this point was adopted as a criterion for distinguishing the breed's Varieties. In all the Varieties, the hair must always be abundant, dense and of good texture, forming with the wooly undercoat an excellent protective covering. Groenendael and Tervueren: The hair is short on the head, the exterior face of the ears, and the lower part of the legs, except on the back of the forelegs, from the elbows to the pasterns, which are garnished by long hairs called feathering. The hair is long and straight over the rest of the body and longer and more abundant around the neck and on the breast, where it forms a collarette and frill. The opening of the ear is protected by tufted hairs. The hair from the base of the ear is raised back and frames the head. The thighs are covered with very long and abundant hair, which forms culottes. The tall is garnished with abundant hair, forming a plume. Malinois: The hair should be short on the head, the exterior of the ears and the lower parts of the legs. Short on the rest of the body, thicker on the tail and around the neck, where it forms a slight collarette beginning at the base of the ear and extending to the throat. In addition, the hindquarters should be fringed with longer hair. The coat should be thick, close and of good firm texture with a woolly undercoat. The coat should conform to the body without standing out or hanging down. The distribution of hair on the tail simulates an ear of wheat. Laekenois: The hair is rough and of a harsh state, which further appears disorderly. The length of the hair is noticeably the same on all parts of the body. The length is approximately two and a half inches (six centimeters). The hair around the eyes and the hair garnishing the muzzle is not excessive. The existence of a hard, rough beard and moustache on the muzzle are mandatory. The tail does not form a plume. The Groenendael is the long-haired black. The Groenendael may be all black, or may be black with a small to moderate white patch on the chest, and the tips of the toes may be white. White or gray frosting on the muzzle is acceptable. The Tervueren is the charcoaled, long-haired, other than black with dark mask. A small to moderate white patch is permitted on the chest, and the tips of the toes may be white. White or gray frosting on the muzzle is acceptable. Body Fawn and Sable: All the gamut of colors through beige to gray, with charcoaling. The coat is characteristically double pigmented, wherein the tip of each hair is blackened. On mature males, this darkening is especially pronounced on the shoulders, back and rib section. The under parts of the body, tail and coulottes are cream, gray or light beige. The coat characteristically becomes darker with increasing age. Allowance should be made for females and young males. The tail typically has a darker tip. Face: The face has a black mask. The preferred mask is well pronounced, stretching to unite the upper and lower lips, the corners of the mouth, and the eyelids, in a single dark zone. The ears are mostly dark. An open mask or mostly black head is acceptable. The Malinois is the short-haired, charcoal, other than black, with a dark mask. The small to moderate white patch is permitted on the chest, and the tips of the toes may be white. White or gray frosting on the muzzle is acceptable. Body: Fawn and Sable (all the gamut of colors through beige to gray), with charcoaling. The coat is characteristically double pigmented, wherein the tip of each hair is blackened. On mature males this darkening is especially pronounced on the shoulders, back and rib section. The under parts of the body, tail and coulottes are cream gray or light beige. The coat characteristically becomes darker with increasing age. Allowance should be made for female and young males. The tail typically has darker tip. 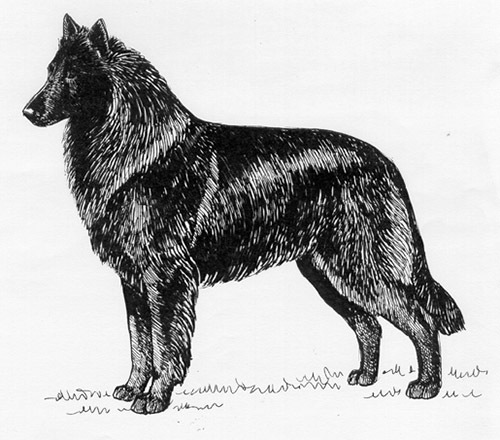 The Laekenois is the rough haired other than black, with traces of charcoaling, principally on the muzzle and tail. A small to moderate white patch is permitted on the chest, and the tips of the toes may be white. White or gray frosting on the muzzle is acceptable. Body: Fawn and Sable (all the gamut of colors through beige to gray), with charcoaling. The coat is characteristically double pigmented, wherein the tip of each hair is blackened. On mature males, this blackening is especially pronounced on the shoulders, back and rib section. The under parts of the body, tail and coulottes are cream, gray or light beige. The coat characteristically becomes darker with increasing age. Allowance should be made for females and young males. The tail typically has a darker tip. Disqualifications: All varieties. Albinism. Solid white markings elsewhere than on tips of toes, chest, or frosting on muzzle. In Tervueren and Malinois, the absence of black on one or more of the following points: ear bases, eyebrows, sides of muzzle and underjaw. Males under 23" or over 26.5". Females under 21" or over 24.5". Unilateral or bilateral or cryptorchid. 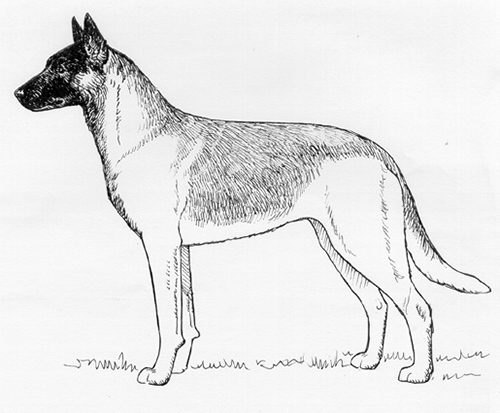 In Tervueren and Malinois, the absence of black on one or more of the following points: ear bases, eyebrows, sides of muzzle and underjaw. 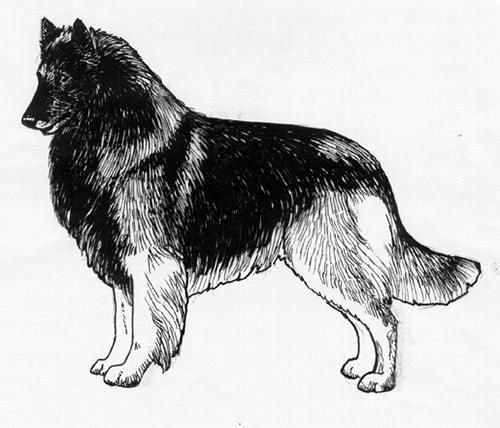 In UKC Conformation Shows, this breed is shown by variety in this order: Groenendael, Laekenois, Malinois, Tervueren.